Why do I call myself a Body Psychotherapist? When I work, I use both verbal and non-verbal interventions. I analyze, I make contracts, I integrate cognitive, behavioral, somatic and social elements, I touch (in ways that can be supportive, neutral and/or evoking), I work from ethical guidelines, I teach and I confront, I use developmental theory and character structure theory, I use transference and countertransference concepts, and much more. My intention is to help clients with issues that prevent them from functioning in the world, help them to overcome obstacles and to develop new resources. This is my focus – whether I am dealing with developmental trauma or shock trauma, whether the client is young or old. So, I am not only a Body Psychotherapist, although I call myself a Body Psychotherapist – but what else can I call myself? Integrative Body Psychotherapist? Mutual connection and Body Psychotherapist? If I leave out the “body” in the title, it doesn’t tell that I work differently from other psychotherapists – I think – so maybe I keep it because I am proud of the scope and precision with which I include the body in psychotherapy. 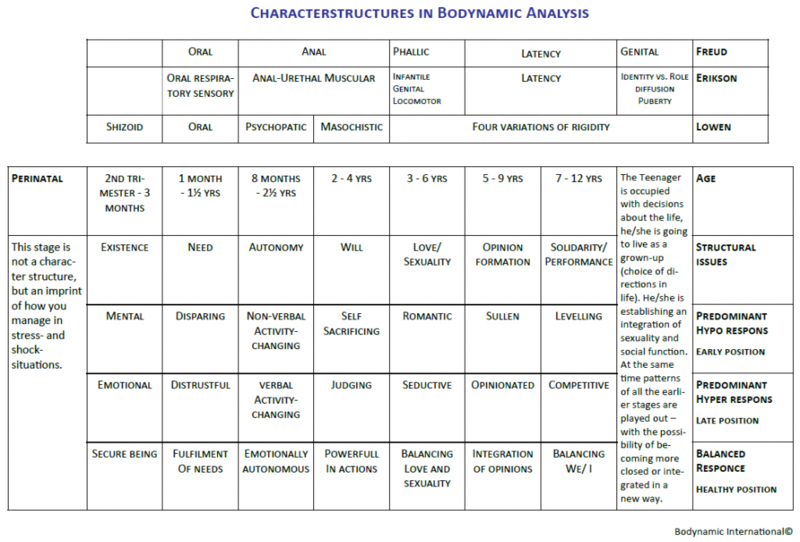 In this article, I will share with you, why and how I became a Body Psychotherapist, and I will give you a taste of the Bodynamic system and its possibilities. I became a Body Psychotherapist because I made a decision concerning this, when I was a round three years old. I was born at the beginning of the World War II. My parents were part of the resistance movement, and we had different underground people living in our two-room apartment. There was one person in particular, that I was not allowed to know was there. And what does a child then do? I started to smell the smells, and found out that it is possible to smell if and when there are “other” people present even when they are hidden. I also started to read bodies. I read my parent’s bodies, so I could know when they were afraid and they did not tell me. In my family, all emotions were allowed but one – fear. Fear was taboo, because it was dangerous then to show fear. Fear could be recognized, and if it was, “the enemy” might find out we were hiding freedom fighters. Was I right about this “special” freedom fighter? Yes! This is why and how I started to read bodies. I also trained my own body from a very young age through acrobatics. I am convinced that this training was one of the reasons that I did not dissociate more than I did. I had many “out-of-body” experiences, but by keeping up the training of my body, I stayed present in reality. This is also what I later wanted to teach others to do – to stay healthy by using their physical body and being aware of it. I also became an animal lover and amateur researcher. I started to tame many kinds of animals, and I learned very early what it means to have boundaries, and about keeping boundaries, pulling boundaries closer to yourself and keeping boundaries very firm. I had become aware that only by keeping my boundaries very firm would wild animals dare to come near to me – and then it is possible to tame them. This is also the background for my interest in the fairy tale “The Little Prince” (by Antoine de Saint Exupery), where the little prince learns to tame the fox. I believe that such a practical training element will be very good for all future psychotherapists – learning how to keep your boundary. My interest in animals also gave me an interest in human beings from different cultures. As a young child, my parents would read books for me telling me about the works of Konrad Lorenz, Margaret Mead, Thor Heyerdal and others. A book by Konrad Lorenz, the animal psychologist (ethologist), was the very first book where I read about “early bonding”. He talked about the need for bonding with the goose egg before it hatches, if you want to be a foster mom or dad for the new gosling. Later I also saw films about this. This was already documented in the 1930 s, but it has taken many years for therapists to accept the possibility of a very early bonding (already) in the womb in humans. This was later documented in many books by authors belonging to the Pre-and Peri Natal Psychology Organization in USA, including David Chamberlain (Babies Remember Birth) and Thomas Verny, (The Secret Life of the Unborn Child). This is some of the background for my view of human nature – that human beings have a natural drive towards Mutual Connection (including Early Bonding) – and that all later difficulties involve some breaking of Mutual Connection. So, all the above was part of ME when I went on to a professional career. I became a “Relaxation teacher”. In Denmark, this is a special education that resembles psycho­ motor training, Rosen-training, Body-Mind training (Bonny Bainbridge-Cohen), and some dance therapy orientations. It is an education that is intended as a bridge between the medical field and the educational field. It is a little like physical therapy, but with a lot more knowledge about child development, a lot more psychology, and less of the medical subjects. Its main focus was to teach body awareness to the general public through movement classes and individual treatments. During this training, it became clear to me that the focus at that time was to work with tensions in the body. One of the subjects taught was a kind of massage where we did not really “break” the stiff muscles, but massaged them in a way where we “forced” them to relax, relax and relax. The result of this was, sometimes, that people fell in to depressions or similar symptoms, rather than becoming energized. Personally, I fell into a lot of my shocks from the war and became depressed. This made me want to change the system in order to prevent this from happening to anybody else – and I did! Already during my education I started to find a new way – a way that led to the development of the hypo-responsive muscle concept (and its polarity, the hyper­ responsive muscle concept). The basic idea is that muscles are not only tense, hyper­ tense or armored as Reich labeled them, but they can also be flaccid or hypo. And hypo- responsive muscles need to be treated differently than the hyper- responsive muscles. One of my inspirations was a Norwegian psychiatrist and neurologist, Trygve Braatoey, who had written a very exciting book about the nervous mind, already in 1947. In the book he stresses the importance of working with the body and with body awareness when dealing with psychiatric patients. Braatoey started to work with the bodies of patients even before Wilhelm Reich came to Norway around 1939. Another inspiration was Lillemor Johnsen, a Norwegian physical therapist, who was working with what she called hypotonic muscles or hypotonic flesh. She said that “the impulse that you give up” is hidden in the hypotonic muscle quality – not the hypertonic muscles – and when you work with these muscles to wake up the impulse, then you are working with the resources (waking-up the resources). I decided to develop a system that included the hypo-development in muscles. This led me to develop the concept of a “muscle response” that was based on palpation. At the same time, I was propelled in to major studies of psychology, Gestalt Therapy and Transactional Analysis. The result was that I continued to “put things together”- especially knowledge about muscles and their associated movements in children at different age levels (from birth on and further up to adolescence). Which muscles is the child using at different age levels? What happens with the child at a certain age level psychologically, cognitively and emotionally, and can these themes be “recognized” IN the muscles? The answers to these questions are part of our background for doing very precise psychological “Body Readings” – a skill we teach in separate workshops – and for doing very precise “interventions” related to the issues the clients want to focus on. So, I started to develop a manual muscle testing system. I started to test (a special way of palpating the muscles with a pulling and letting-go action) most of the surface muscles and many deeper muscles. I would sense the response they gave compared with my initial pull of the muscle. I created 9 different categories of response – 4 hyper-responses and 4 hypo -responses (inspired by Braatoey and Lillemor), plus one neutral. Within 2 years the research was complete and the material was ready. Later we named the whole process the “making of a Bodymap”. In order to get a physical sense of what I mean, I want you – the reader – right now to touch some specific muscles on yourself – and experience what I mean: The muscles along the spine (erector spinae) are nearly always hyper -responsive. They resist you when you try to pull across them. Another way to put it is that “they push you out”. Sometimes they are even so hard that it feels like you roll on top of a rope. By contrast the muscles on the back of the upper arm (triceps) and on your shoulder (deltoids, especially the back part), are often flaccid. Here there is little resistance when you pull it, and when you let it move back into place it feels like it is more or less slow in returning to its starting point. This is what I call hyporesponse. (A physically strong or trained muscle does need more pulling power, but will still have no resistance against the pull). All muscles can either be hypo, hyper, or neutral – it depends mostly on the nature of the Mutual Connection, the relationship between child and parents (adults). After developing this Bodymap I went back to my school, became a teacher there and “changed the whole curriculum”, so that it incorporated the ideas above. All my students now had to learn this newly developed Bodymap process. During this process, I noticed many interesting things. Here is a little taste: When I was touching a hyporesponsive muscle on a client, often another hyporesponsive muscle would start to react, and if I then ALSO touched this second hyporesponsive muscle (only after the client mentioned it), something psychological REALLY started to happen – and the most interesting thing was, that it was always related to the initial issue that the client wanted to look into. This insight led me to insist that we always ask the client what he wants to work with, wants to focus on, before we do any other interventions. So, we established “the contract”. If you just “went into the body” before asking, something for sure would “come up” – but you would not know whether the client wanted to or was willing to look at it. The next research project was to establish the connections between psychological issues and specific muscles. Over a period of five years my “therapy” trainees were writing “session” reports about which muscles they were touching and which issues they were speaking to in the sessions. They also tracked which age levels they were working with in relation to both motor development and psychological development. The client also separately filled out a report for each session, answering similar questions. Over the five-year period, I received close to 15,000 reports with detailed information, and it is from this project I extracted my precise knowledge of relationships between specific muscles (and their age level) and specific psychological content (the so-called problem). Around 1980 there was a split in our relaxation school. I had wanted to upgrade the psychotherapy content, but the school board wanted less psychotherapy, while keeping the focus on body awareness. I collected a group of colleagues and students that resonated with my vision, and working collectively we created the Bodynamic Institute (1982) and the Bodynamic Analysis System (1985). I am very proud of the ways we developed the work together. Also, doing it this way made it a 10-person system, not a one-person system, and I am very proud of this. One-person systems have a tendency to have “blind spots” that usually relate to that one person’s personal problems. A multi-person system will have fewer “blind spots”, because some will be able to see what is wrong or missing. One of the first things we did together was to test our hypotheses (above) on real children, to see if the relationship between individual muscles and age level was in agreement. A little glimpse into this process follows. When you touch a muscle on a child, and the child does not react, you can suspect that this muscle does not correspond the age level of the child. When the muscle reacts, and the child shrugs you away, you can suspect that this muscle belongs to the age level. The results showed that our initial hypotheses were very accurate. The reliability of the Bodymap. But what about the reliability of the Bodymap? Could we really train students to do this subtle test? The answer was “Yes!”. One of our colleagues, who is also a psychologist (L.Οllars), did the research that proved this. Ιn this project he had 5 trainees (from different classes) each test the same 5 clients – 5 tests per person (a sufficient time was allowed between repeated tests of the same client) . How was the reliability? the results from comparing the different muscle palpations showed a consistency between 90 and 98%. So, we trust the Bodymap, which provides us with information concerning the resources available to the client and the problems the client has – according to our test. The degrees of hypo- and hyper -responsiveness in the test indicates issues that are unconscious (degrees 3. and 4), issues that are pre-conscious (degrees 1 and 2), and finally some issues that are very conscious (degree neutral). Just one example to illustrate insights from the reading of a Bodymap. A client may very well present his problem as a lack of friends or difficulties in making friends or finding a partner. When this problem is translated in to muscles we would expect to find biceps muscles that are hyper – or hypo responsive in the degrees 2,3 or 4. When we test these biceps muscles (they can pull things/friends closer) they often are tested as degree 1 or neutral. This means that the client HAS the resources to make friends, so something else is the REAL problem. When we then test his triceps muscles (back of the upper arm) they often show hypo – responsiveness in the degree 2,3 or 4. this means that under stress he cannot say NO to other people. And this is his problem: If he makes friends with another person he does not have the capacity to say NO when he wants to. In order not to put himself in this situation, he never invites people close, and then he presents “a lack of friends” as his problem. This example shows that the client needs to be taught how to say NO and supported in it, before he can go back to saying YES. This conclusion also gives me a chance to stress that being in therapy is only part of the client’s work. Another part is for him to go out in the world and practice what he has learned in therapy – because the test for REAL change does not happen in the therapy session, but in REAL life. The issue in this example would at some time probably also be detected with a more cognitive approach, but I use it here in order to give a taste of all the information that can be decoded from a Bodymap that provides information from 400 muscles or parts of muscles. For the experienced therapist 400 pieces of information were OK to play around with, but for the student trainee it became too much. We therefore developed a model with “boxes”, one that was easier to learn and remember. At that time, there were already many models a round, including many from Reich ‘s time. Our model was given 3 boxes at each age level, a “hypo” response box, a “hyper” response box and a “healthy” response box – a response in relation to the parents’ way of “meeting” the child. We created 7 different overlapping age levels covering the ages 0-12 years old, and we gave them names corresponding to the major theme that develop at each age level. We all grow up through these stages (boxes) and we get more or less stuck at each age level – and we have more or less access to resources at each age level. This is the information that guides the therapist in helping the client to overcome his issues. To learn more about this I refer you to the book edited by my Canadian colleague, Ian Macnaughton: “Embodying the Mind & Minding the Body”. The Will Structure – see the drawings on the last two pages (editor – drawing missing). I am showing you a drawing made from a photo of a boy, with specific muscles (from this “will” age level) drawn on to the picture. the boy is 3 1/2 years old and the character structure is the WILL structure (2-4 years old). This is the time period where you want to say NO, where you want to be YOU, where you want to ACT, and DO things, and MAKE things happen. This is the reason that children have to say NO to parents, because otherwise they feel as if it is not me that is doing it. So, when you are working with a child of this age, you need to give him at least two possibilities so he does not believe that he is taken over by the parents. An adult that is stuck in this WILL structure has the “same” problem. As soon as the therapist asks him or tells him to do something, he will respond by saying “don’t decide for me – don’t push me”. So, give him two possibilities to choose from and ask him to focus on body sensations (and name them) simultaneously. In the drawing the boy is throwing a stone (on a beach) which can be a very powerful experience. Throwing with all your power, sensing all your power, and still having a sense of contact – this is the trick. With an adult client, we may have to build up his power in a similar way, before the therapist explores the reason behind being stuck in this WILL structure. The pictures show some of the possibilities our approach gives us. All age levels have certain movements they do “naturally”, and in order to do them, certain muscles MUST be exercised and used – and it is from here, that we get some of the knowledge about the relationship between muscles and age level. It also informs us about which movements the therapist might do well to look for (and sense if they are healthy or stuck). The Autonomy Structure – see the drawing at the top of this post. This next drawing is from the autonomy age level (8 months – 2 1/2 years). The child here is not talking a lot, but he is experiencing a lot while beginning to sense his own space. He is trying again and again to move in the world, to walk, to run. He cannot stop without nearly falling and he cannot turn while running. He has to stop before he can turn. Many movements he can do, and many others he cannot do yet. Look closely at the drawing and look at the hand lifted straight up and pointing with a finger forward. this is a very precise movement that the child was not able to do before this age level. It is as if he is saying “I have to point at everything because I want the words now” (“what’s that?” is what he keeps asking). Right now, I would like you to please stop the reading, stand up and do this specific pointing with your finger while the arm and hand is above the head. Please be specific in the details – sense it, and think about your experience. Thank you. One of the main muscles involved in this movement is the middle part of the deltoid, and when you do this movement you can sense it is tensed. The psychological issue is one’s sense of “getting space”. It is like the boy in the photo is saying “I can have all this space, and can have space around me and it is mine” (what he senses at this age is either “mine” or “me”). When this muscle is collapsed, it means that he has begun to lose his right to have his space. So, when he comes in to a room he will collapse and not show himself. If an adult presents this lack of personal space as a major problem, we know that this muscle is involved – and that finding a way to contact the muscles makes therapy easier. We have developed a very important communication model, and we call it the Bodyknot. First I will argue why it is important to differentiate between outer sensations, inner sensations and interpretations of the outer sensations. Think of the beginning of life, the very little child – do they have memory ? Do they even remember their birth ? When they get 3-4 years old many children tell me about their birth, when they are about 3-4 years old, if I ask them. Here is one story for example, “It was very hard, mom would not let go of me, and then suddenly I was washed out” – told by a 4 year old where the mother was overdue, and therefore received a medical intervention. Stories like this include information that is so rich in details, that it is clear to me that they are talking about their birth, even without any knowledge of what happens in a birth – and telling their memory with words they could not even pronounce earlier on. Only the latest brain research now tells us that we can already store memory from the time before any words …. when we first start to use the body – and this memory gets stored in the hippocampus (an area for orientation). It is a kind of Body-knowing­ memory. When we start to think with words we have another kind of memory that is stored in the cortex. But the Body memory is one we can access by starting to move the body in patterns similar to the original movement patterns. When I have an experience like “a butterfly”, then what really happens is that my belly starts to do a kind of movement, by using the muscles – a very clear sensation, which has an emotion tied to it. Based on a clear sensation and clear emotion, an impulse may be awakened, an impulse to do something – not the action itself, but just the impulse. The impulse is compared to the memory bank of the little child in order to find out if it is an OK action to carry out, or if it is one that leads to penalty or reward. This is a kind of knowledge you have even without words – and this may lead to choosing another action than the impulse showed you, even though it never becomes conscious. Knowing this is important for the therapist so that he can teach and teach and teach the client this. The main idea is to teach the clients to be able to separate the different elements as mentioned above, and to stay conscious about this. This makes it possible to stay in the reality and not in the interpretations. It is our experience that teaching this to our clients greatly improves their ability to make contact and to make choices about developing themselves. I want to finish this introduction to the Bodynamic System with a taste from the model we call ” Ego Aspects“. This will show that we are always working with more than the body. But first let me repeat and stress my experience that “you need to work with the body, if you really want to change”. 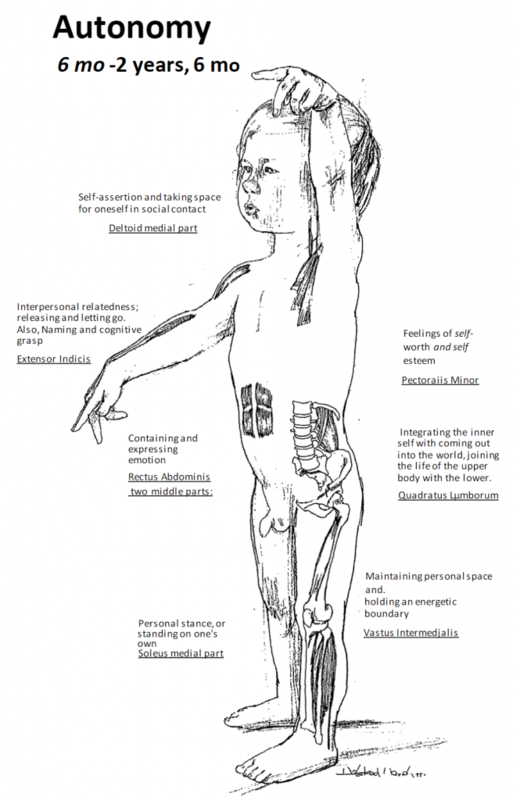 The Body Ego develops from before birth up to around 4 years old – and it is actually not possible to really release and change developmental trauma from this age level without working with the body. The Individual Ego starts to develop from around 3 years old, and you cannot change problems from this Ego Aspect without using language, knowledge, and understanding. You can still work with and include the body, and it feels much easier because the development from this Ego Aspect is also connected a lot with new movements – but you have to include language and communication. When you work with the Role Ego, which starts to develop from around 3 1/2 years old, you don’t need to work with the body. Working with language is the most important because your Role Ego has a lot to do with understanding where you come from, your norms and value and your social background. In order to integrate outcomes, of course it is easier when you also use the body. But it is not necessary with issues from this Ego Aspect. The fourth Ego Aspect we call the Observing Ego, and the way we work with this depends on the problem. If the problem is in the Role Ego, the Observing Ego needs knowledge, teaching, and understanding, so that the person pays attention to how they are being received – and if they are received as they intended. If the problem is in the Individual Ego you need to mix body and mind. By this I mean that you have to keep an eye on your emotions, your intentions and actions (including mimic, voice, role and movements) – and observe how the other person is impacted. At the same time keep sensing your body and also verbalize what you sense. If the problem is “only” in the Body Ego, we have to use the body to get a larger “animal-foundation” in the Observing Ego – not only touching it physically, but also making the client sense it. The child must all the time sense the body and the emotions in the body. This builds the foundation of the body, which then functions as a container for all emotions, energy build up and impulses. A person can never stop the development of the Ego Aspects. If we imagine that a child has developed a healthy Body Ego over his first 4 years, it will still continue to develop beyond this age level. However, whatever happens after four years of age cannot disturb the foundation. The exception is if a shock trauma happens – this is the only thing that can disturb the existing foundation. The same goes for the other Ego Aspects. They never stop developing and if they are originally healthy their fundamental resources can never be disturbed except through a shock trauma. Here ends my article. I have shared with you how I came to be a Body Psychotherapist. And I have shared with you pieces of how I (and my colleagues) have developed ideas and models (Bodymap and Character Structure models), have established relationships between muscles, psychological content, and age levels, have developed our language and communication model (the Bodyknot), and finally how I am using an Ego Aspect model. A lecture presented to the Netherlands Psychological Organization’s conference in October, 1999.